« Will we ever understand what dark matter is made from? Whether we like it or not, those of us who write about scientific topics (even at a relatively unknown blog like this one) end up being the public face of science. I was reminded of that fact very strongly last week, and I’m still pondering the lessons I learned from the experience. Then I stepped in it: I wrote back to Ed, saying something unfairly derogatory about the publication that mocked Canseco (which I subsequently deleted, with an apology). During the resulting back-and-forth exchange, my friend Brian Switek proposed each writing a blog post, focusing on our own areas of expertise. 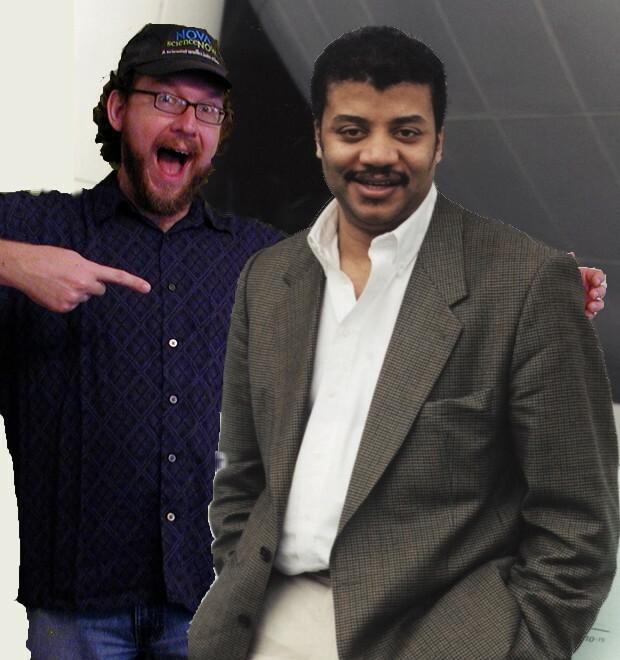 Brian’s two posts discussed dinosaur reproduction and blood pressure; mine discussed gravity. That’s where things stood for me until last Friday night. In the interim, Brian and Canseco were discussing the topic on Twitter, and I’ll let the conversation that followed speak for itself. Summary: I spent a fair amount of Friday night talking about gravity with Jose Canseco in a very friendly way, which ended with him inviting Brian and me to hang out with him in Las Vegas, if we’re ever in the city. Both Ed and Jennifer Ouellette (very good at the science communication game herself) praised Brian and me for Doing It Right. At this point, I could pat myself on the back and say “good job”. However, I was raised in the American Midwest, which means I’m not allowed to accept any kind of praise without saying, “Thanks, but….” (We didn’t believe in the Evil Eye growing up, but we kind of behaved like we did anyway.) So, I’ve been second-guessing myself, and pondering how to do better in the future. The first thought is one Ed Yong previously raised: why did none of the other writers who mocked Canseco say why the “weak gravity” idea is wrong? Besides the easy answer—mocking requires relatively few words, while explaining the real science can take a thousand or more to do properly—I think it may have to do with degrees of obviousness. Most people, looking at Canseco’s tweets, could probably tell you that Earth’s gravity wasn’t half its modern strength, but could they say why? Anyone who writes on websites for any length of time will run across the commenter who says things like “I found a typo or grammar error in your post, therefore I can’t trust anything else you write”. (Worse are ones that say in effect that the commenter wouldn’t phrase things in a particular way, so therefore the writer knows nothing.) I know I’m always finding grammar errors in my posts after they’re published, or even spelling mistakes (which my spellcheck software should catch!). When writing, I’m very focused on content, so it’s not surprising small errors creep in. I wonder sometimes if that isn’t a dodge: the commenter cannot insert themselves meaningfully into the story, either because they don’t understand what it’s about, or they understand well enough to see they can’t add anything productive to the conversation. The negative snarky articles about Jose Canseco might also fall into that category: it’s easier to poke holes than to be constructive. For me, a trained physicist whose Ph.D. thesis had a lot to do with gravitation, the problem with “weak gravity” is pretty obvious. Similarly, Brian Switek just wrote a whole book about dinosaurs, one chapter of which dealt with the question of how some of them got so huge. I’m no dinosaur (or geology) expert, but I could state with confidence that gravity didn’t change much in the last 100 million years. Similarly, Brian was happy to pass any physics stuff along to me, but he could draw on his expertise to say that sauropod dinosaurs weren’t nearly as massive as they might seem. What is obvious to him isn’t to me, and vice versa. A major part of science communication is understanding that relative obviousness. My undergraduate thesis advisor spoke often about “building intuition”: that we aren’t born physicists, but we can learn to think like physicists with practice and training. Once we have that skill, things become obvious that aren’t necessarily so to non-specialists. It’s not anything magical—it’s something available to other people, if they are patient and dedicated. I know a number of good physics writers with no formal physics training; they’ve built that intuition over time. A common concept in journalism or science communication is the “deficit model”, which says that people’s lack of acceptance of (say) evolution or climate change is because they simply don’t have enough facts. A major problem with the deficit model is that the human brain is perfectly willing to reject any fact that doesn’t fit into the intuitive worldview we build up. (This is something Liz Neeley and John Bruno spoke about at ScienceOnline, but unfortunately I missed her session, since one of mine was at the same time.) The problem is, if the deficit model is wrong, then those of us who do science communication have to work harder, acting as educators instead of just as reporters of fact. We have to help people build their own intuition, bringing them to a level where they can understand—at least in part—why an explanation is trustworthy. Another common misconception is that, if a writer states something, it must be his or her own idea. If I ever continue the conversation with Mr. Canseco, I’ll bring that up: you’ll note in the Twitter conversation linked above that he attributed the sauropod size study to Brian, and gave me credit with Einstein for gravity. However, both of us are quick to say that these ideas aren’t original to us: they come from many researchers, in some cases stretching back centuries. My authority in asserting that gravity hasn’t changed in 100 million years doesn’t rest on my own research, which hasn’t dealt with planets at all! However, we are all part of this web of trust: scientists doing research, people communicating about said research (whether their own or others’ work), and those who read or listen. Nobody is simply a passive, empty vessel to be filled with knowledge. We science communicators have to trust our readers and listeners to be intelligent, and give them our respect. I think that your ideas apply to pretty much all internet discourse, not just science. I wish more people would take the time to discuss and explain their ideas. After all, that’s when learning happens (on both sides) and we can advance as people, communities, and as a society as a whole. My grandmother would say, How do you know for sure? Vas you dere Charlie? Great response to Jose and great post. I was told a story the other day of a state lawmaker who wanted to tax bicyclists as polluters because they respirated more. The rationale was that they thought that respiration contributed to greenhouse gases. Of course I thought that was pretty idiotic but hours later I could not remember exactly as to why (something vague and half remembered about the exchange process between trees/humans/atmosphere). So stumbling on this blog brought that idea home. But I wonder how far you’d go in trying to explain over mocking if Jose or anyone else rebuffs the explanation. At what point do you realize someone is not open to non-mocking education? By pointing out simple errors like spelling and grammar, I’m trying to do something for the author’s benefit, prompting a minor revision and leaving the content free from a problem that might alienate the next truly snarky soul stumbling upon the piece. I do make an effort to do this privately, but don’t always preface my casual notes with “Gee, I’m sorry, I don’t mean to offend you, but…” Some people might call me a Grammar Nazi. Relax. Find some joy in the fact that I’m listening and reading the work carefully. And I agree with your point here. In fact, I’m now rather proud that when I passed the Canseco story on, I tried to explain my understanding of the primary condition that allowed massive creatures to evolve. Biologically, it’s the presence of abundant atmospheric oxygen, isn’t it? Brian covered how sauropods got big in one of the posts linked above: http://phenomena.nationalgeographic.com/2013/02/25/dinosaur-reproduction-not-ancient-gravity-made-sauropods-super-sized. Short version: oxygen levels were not the cause (though those are implicated in an earlier era when insects got huge), but rather sauropods weren’t nearly as massive as previously thought. As for grammar and spelling corrections: my primary concern is when people mistake criticism of such things for criticism of content. I don’t mind if someone finds errors in what I write, but I do mind if they think that a spelling error means my physics isn’t trustworthy. This was a great post! I thought it was so cool that Jose Canseco was wondering about how those giant dinosaurs got around, and thinking up possible explanations, and putting his ideas out there. I actually never heard of him before reading about this, but I’m a non-scientist who likes to learn about things, and these were fascinating questions. I never thought much about huge dinosaurs before but when you think about it it does seem crazy to think about how their blood pressure would work and all of that. Interesting stuff! I was dismayed that so many people were mocking him. To me it seems just wonderful if people want to bring up interesting stuff like this and talk about it. It seems like so many scientists do look down on the rest of us. But I read your post and Brian Switek’s with great interest–hats off to you for taking these ideas seriously and explaining things in a way that’s accessible to all. A lot of things that are solid science sound really crazy. Like quantum mechanics and the Higgs boson. So, if someone hears an idea that sounds really crazy, like that gravity on earth was much less when the dinosaurs roamed than it is now, isn’t it somehow anti-scientific to be snarky and to feel you know for sure IF you can’t actually explain it? I know some who mocked him probably did understand and didn’t want to bother, but I’m sure many derided his ideas but couldn’t have really answered them. If you think you know for sure it’s nonsense but you don’t know why, isn’t that similar to not actually understanding it? And also, is it possible for a person to really truly deeply understand something but be unable to explain it to a person who knows less? I’m wondering about teachers who can’t answer questions. I had a lot of great teachers, but the poor ones usually seemed bad to me because they couldn’t answer questions or discuss anything freely, but it was more that they would assert what the book said and say you can’t talk about anything that won’t be on the test. Would those people likely not understand the material very well, or are some people truly excellent in their area of science but just can’t really explain it to someone who doesn’t already know it yet? …is it possible for a person to really truly deeply understand something but be unable to explain it to a person who knows less? My personal feeling is that if you can’t explain it to someone else, then you don’t understand it very well intuitively. However, within those confines, I think some people are simply going to be better at explaining than others! Some people cannot remember what it’s like not to be a professional scientist, so they forget what non-scientists do and don’t know. So, they might be explaining something pretty well to a peer, but failing to convey the same level of information to a non-specialist.